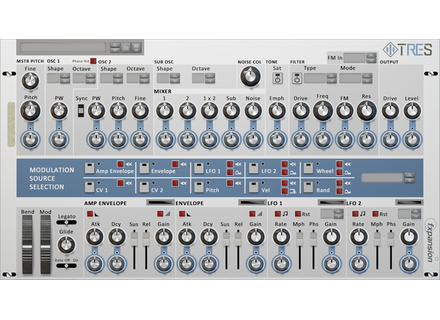 Tres RE, Virtual Modular Synth from Fxpansion. FXpansion adds a new virtual synth to the Rack Extension collection for the Propellerhead Reason 6.5 and 7 DAWs. 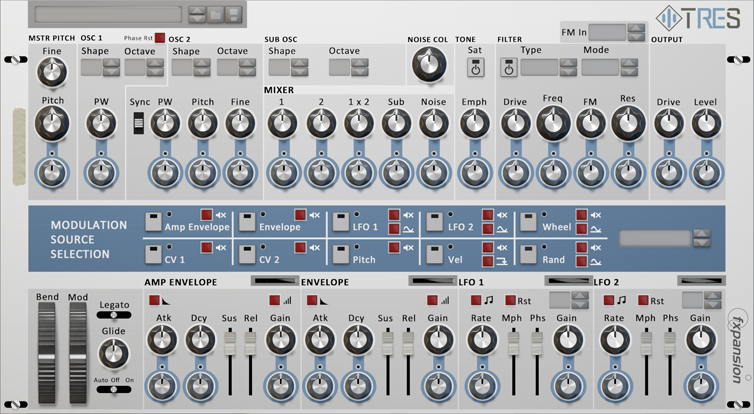 Tres is a monosynth that uses FXpansion DCAM circuit modeling technology and TransMod advanced modulation system in order to create bass, lead, percussion, effects sounds and more. The synth features 2 oscillators and a sub-oscillator, Filter and VCA sections as well as 2 LFOs, envelopes and supports external CV sources for modulating the most important parameters. Full details and purchase at shop.propellerheads.se. Antimatter ReFill for Antidote RE Users of the Synapse Audio Antidote RE for Reason can now add sounds to the virtual synth thanks to the Nucleus SoundLab Antimatter ReFill. Boscomac The Chiller free multi-synth The Chiller is Boscomac's new add-on instrument for Reaktor, which combines three bass, classic and string virtual synths.